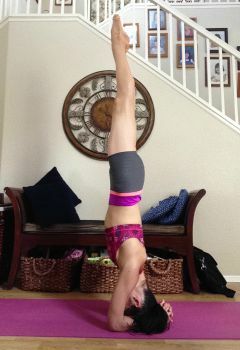 Headstand is one of those poses that can seem scary and unattainable. Your whole world is quite literally turned upside down and seemingly supported only by your head. Learn to use your whole body in alignment to support you, and get accustomed to inverting! Inversions are enormously beneficial to the nervous system. Having the head below the heart is soothing and cooling for the nervous system and is wonderful for toning down stress. Fresh, oxygenated blood is sent to the brain which can help manage anxiety, depression, and insomnia. Stimulates the lymphatic system which removes toxins and boosts immunity in the body. Improves digestion by sending more blood flow to internal organs and moving stuck energy. Relieves swollen legs and feet from excess fluid build up. Strengthens upper body and core. For optimum support of the neck, we will use a supported grip in this variation of headstand. 1. Grab opposite elbows and place your forearms on the ground — this will provide the proper distance between the elbows. 2. Keep the elbows where they are and release the grip, interlacing your fingers together. 3. Come to a comfortable squat and place your head up against your interlaced fingers, getting comfortable with the idea of your head on the floor. 4. Make sure that you are right on the crown of the head, not the forehead, and start to lift your hips up so that you become accustomed to more weight on your head. 1. Once your hips are above the head, experiment with lifting one foot, bending it in tight. 2. Float the second foot and use your core to draw both knees close to the chest. 3. Once you become comfortable here you can start to extend one leg up and then the other, using a wall behind you at first to catch you if you start to tip back. To reduce excess pressure in the neck, really press the forearms and elbows into the earth as if you could lift your head off the floor. So as to prevent arching in the spine, draw the belly up and in, exhale to soften the lower ribs so they don't protrude out. Internally rotate the legs and press the big toes together to activate the legs. Point the feet but flex the toes back for maximum energy upwards in combination with the pressing of the arms downward. Hopefully, you can approach headstand with a little less fear by keeping these progressions and tips in mind! Don't be afraid to approach a teacher or utilize a wall to help you at first and work through each step at your own pace.